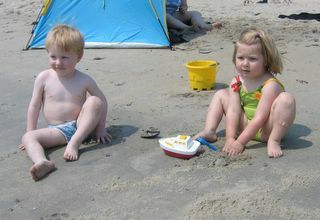 Eric and his "girlfriend" Madeleine on a trip to Revere Beach. Becoming Bree Van De Camp? So, last night I made this really good dinner and I suddenly had the urge to have a really nicely set table with wine glasses and candles. It was my first "official" day of unemployment and I've already gone Stepford. What's up with that? Fortunately I asked Rich to set the table, which means two hastily thrown plates, upsidown fork and knife sitting on a small slice of paper towel. No drinks, no drinking glasses. At a party on Saturday, I wore a skirt and pearls. I thought I was being ironic, or was I? Finally I have a little time to explore two of my passions: cooking and writing. There's lots of things I'd love to be able to do well, like sewing and gardening. But those are a little hard with small children running around. However cooking is a necessity and it's easy to branch out with something I have to do anyway. I want branch out beyond the 10 or so things I rotate on a regular basis. I Just made an orange marinade for a turkey breast I'm going to cook tomorrow. That's new. Tonight I'm making orange rosemary pork chops. I've got a few cookbooks that I've had forever, but now I'm trying to use them more and really diversify my repitoire. I do eat red meat, but I seldom prepare it. I got some lamb chops that are in the freezer. I've decided not to think about where they came from. The writing will come later once Miss Kaylee takes some regular naps!